Atrium Health and Navicent Health announced that they have officially signed the definitive agreement for their strategic combination. The signing is the latest step after signing a letter of intent in February and completing due diligence, negotiations, and receiving approval earlier this month by the Georgia Attorney General’s office. Both the Atrium Health Board of Commissioners and the Navicent Health Board of Directors subsequently voted unanimously to approve this strategic combination, which will be effective January 1, 2019. As a result of this strategic combination, Navicent Health will be a hub for Atrium Health for central and south Georgia, enhancing Macon-Bibb County’s position as one of Georgia’s leading centers for healthcare. This combination will keep the physician community strong and enable patients to access advanced medical services locally. It will also allow Atrium Health to expand its world-class services and economic benefit to central and south Georgia and beyond. Atrium Health will invest capital and work with Navicent Health clinical experts to enhance the depth and breadth of services Navicent Health currently provides. This strategic combination will build upon Navicent Health’s already extensive system of healthcare including its nationally verified Level I trauma center and will increase support for its medical professionals. By working together, Atrium Health and Navicent Health will implement innovative treatment models like virtual care and telepsychiatry throughout central and south Georgia, creating the next generation of health that is better for all they serve. “The combination of Atrium Health and Navicent Health brings together two highly aligned healthcare systems with similar missions and culture and promises to deliver enhanced levels of care throughout the region with multiple service lines for the development of healthy communities,” said Dr. Ninfa M. Saunders, president and CEO of Navicent Health. For more information and frequently asked questions, please visit AtriumHealth.org/WelcomeNavicentHealth. • Navicent Health will be established as the central and south Georgia hub for the Atrium Health network, led by the Navicent Health president and CEO, directing Atrium Health initiatives in the region and enhancing the capabilities of the physician community to allow more patients to stay close to home for care. • Together, Atrium Health and Navicent Health will provide a capital investment which includes $400 million for routine expenditures and designated strategic expenditures to be funded from Navicent Health, $250 million for additional strategic expenditures to be funded by Atrium Health; $175 million for discretionary expenditures to be funded by Atrium Health and $175 million to be funded by Navicent Health. • Navicent Health, in the combination with Atrium Health, will continue to invest in the central Georgia area to identify and address unmet needs of the underserved and uninsured communities. 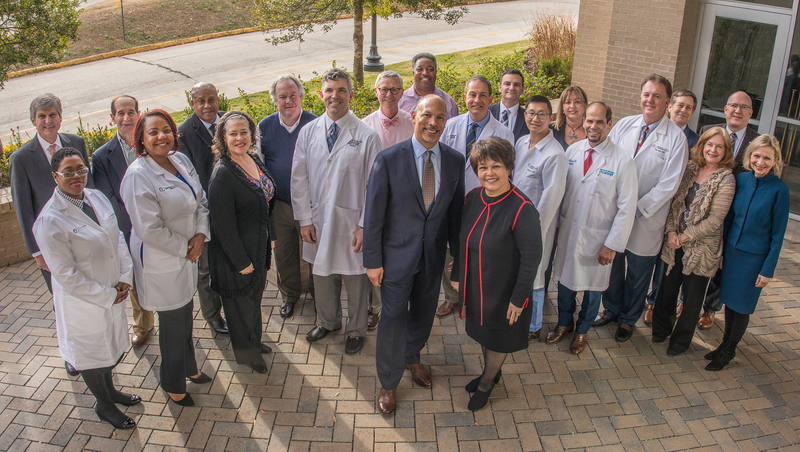 • Atrium Health will maintain and expand Navicent Health’s core services, including its nationally verified Level I trauma center, tertiary services and teaching hospital. • Navicent Health will have two members nominated to the system-wide Atrium Health Board of Commissioners or Board of Advisors. • Navicent Health will continue to be guided by a local board which will include two members from Atrium Health. Photo Caption: Eugene A. Woods, president and CEO of Atrium Health, and Ninfa M. Saunders, president and CEO of Navicent Health, are joined by board members and staff from both organizations, to celebrate the signing of the definitive agreement for the organizations’ strategic combination. As a result of this strategic combination, Navicent Health will be a hub for Atrium Health for central and south Georgia. Atrium Health, previously Carolinas HealthCare System, one of the nation’s leading and most innovative healthcare organizations, provides a full spectrum of healthcare and wellness programs throughout the Southeast region. Its diverse network of care locations includes academic medical centers, hospitals, freestanding emergency departments, physician practices, surgical and rehabilitation centers, home health agencies, nursing homes and behavioral health centers, as well as hospice and palliative care services. Atrium Health works to enhance the overall health and wellbeing of its communities through high quality patient care, education and research programs, and numerous collaborative partnerships and initiatives. Navicent Health was incorporated on November 17, 1994, as a nonprofit corporation whose primary purpose is to coordinate The Medical Center, Navicent Health and other affiliated entities in their mission of providing a comprehensive continuum of high quality, reasonably priced healthcare services to the region. Navicent Health has 970 beds for medical, surgical, rehabilitation and hospice purposes. Navicent Health’s facilities in Macon-Bibb County are leased from the Macon-Bibb County Hospital Authority under a long-term lease. The health system includes The Medical Center, Navicent Health, a nationally recognized tertiary teaching hospital; Beverly Knight Olson Children’s Hospital, Navicent Health, the region’s only dedicated pediatric hospital; Navicent Health Baldwin and Medical Center of Peach County, Navicent Health, both rural hospitals; Rehabilitation Hospital, Navicent Health, the region’s oldest and most experienced rehabilitation provider; Pine Pointe, Navicent Health, which provides palliative and hospice care in homes and in its facility; Carlyle Place, Navicent Health, the area’s first continuing care retirement community; as well as diagnostic and home care services.